February has arrived!! And that means I've gone all things PERSEPHONE!! My thanks again to the lovely Jessie at Dwell In Possibility Blog for setting this all up! 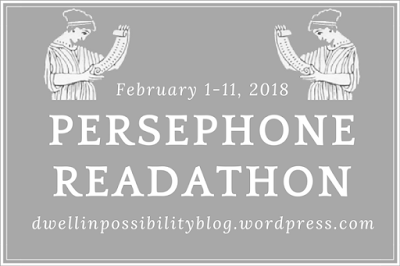 Hoping to add to my Persephone knowledge - somewhat limited at the moment! - over the next few days and I'm sure that will mean a little shopping spree at some time too!! And I will blame you Jessie!! I think the internet is to blame!! Isn't it always!! I'm sure I first saw a Persephone Book on BookTube/YouTube a couple of years ago and I was instantly seduced by the simple grey covers and those gorgeous endpapers and I knew I needed some of these books in my life! I was then very lucky one day to be browsing in a local charity shop and spotted 2 Persephone grey covers so I just grabbed them without even taking any notice of the titles!! Those titles were Greenery Street by Denis Mackail and The Crowded Street by Winifred Holtby. And the first Persephone book I ever read was very recently and it was the gardening book Gardener's Nightcap by Muriel Stuart . As a keen gardener it was the perfect book to pick up and I found it to be highly entertaining and informative!